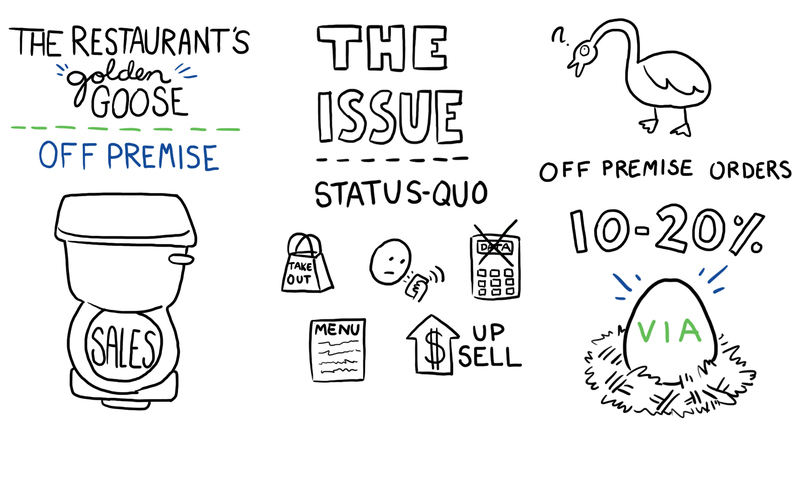 Today, we’re going to talk about the golden goose of your restaurant; that’s off-premise sales. It is the only and fastest growing segment of the restaurant business. And, why you’re flushing a lot of that money down the toilet. Here’s the problem: in today’s paradigm, the issue, the status quo, is what I like to call the Heisman. You see you’re forcing your employees to choose between the guest who’s in front of them and the guest who’s on the phone. Resulting in this: [stiff-arm maneuver], and that’s not good for the guest; it’s not good for the employee. It results in reduced takeout; frustrated guests; getting no data on what the guests are ordering, when they’re ordering, how much they’re ordering; they struggle with the menu; and, they don’t have time to repeat orders for accuracy or for upsell. So, how do we get you the golden goose? The key to recapturing this golden goose, this 10 to 20 percent of takeout sales, is the bifurcation or the separation of tasks. So that your restaurant employees can focus on preparing and delivering world-class food and experience; and, our folks and our technology can focus on delivering a world-class experience in order-taking, in payment, and in upselling, giving you the golden egg. That’s our Virtual Intelligent Automation: the final step in your takeout journey. Trends in off-premise ordering present the opportunity for restaurants to boost sales, increase brand loyalty with more focused services, recapture 10 to 20 percent of their takeout sales, and gain an edge on the growing competition in takeout food services. It’s no wonder off-premise services currently represent the fastest growing segment of the restaurant industry; and, all signs point to continued growth. So, why is off-premise growing so rapidly? What are the benefits? Utilizing off-premise services allows for restaurants to better delegate tasks. With another entity handling takeout orders and/or delivery, in-restaurant employees can focus on providing the best service possible for the guests in front of them that way both dine-in and takeout guests receive a VIP restaurant experience. Plus, with off-premise, restaurants can eliminate dropped calls, help employees feel less overwhelmed, and increase average check through upselling and more focused service. Several top restaurant chains have already begun using off-premise services. These restaurants are focusing time and money on ways to present themselves as go-to providers for great takeout food that is convenient, easy, and delicious. In a Food Newsfeed article, TDn2K’s director of insights, Victor Fernandez, discusses the growing off-premise trend and why he sees it as a very important, rapidly growing sector in the restaurant industry. The article quotes Fernandez saying that out of all the trends they’re seeing at TDn2K, he believes that having and developing off-premise services is one of the must-do steps for casual dining restaurants who want to succeed in today’s market. TDn2K is a research and analytics company that tracks trends, gathers insights, and compiles reports for the restaurant industry. Based on TDn2K research, as of May 2017, take-out and delivery made up about 10 percent of overall sales, and while that appears small now, that’s an 8 percent increase in just two years’ time, the article states. The article also states: “… the brands that are outperforming their peers in the market tend to see the fastest growth in off-premise dining.” Fernandez also states in the article that casual dining restaurants have to present themselves to consumers as a great option for takeout, particularly highlighting themselves as a convenient, fast option for food. Brands that are seeing success in off-premise services include Red Robin Gourmet Burgers, Brinker’s restaurants (Chili’s Grill and Bar), and others. In the article, Brinker’s report that they have seen significant growth in to-go orders in the last five years, a 9 percent increase, which is why they are continually looking into potential takeout and off-premise investments. The article also quotes Red Robin’s CEO Marie Post discussing what the restaurant is doing in off-premise. The restaurant currently uses off-premise services from SYNQ3 Restaurant Solutions, utilizing the company’s take-out ordering services and off-premise ordering specialists. Post notes that they are continually expanding these services to more of their restaurants. So, what are the off-premise opportunities and how can your restaurant take advantage of them? Check out SYNQ3’s off-premise services, which are currently being used by Red Robin, Chipotle, Noodles & Company, and several other top restaurant chains. Get ahead of the takeout curve now with the help of SYNQ3’s off-premise ordering technology and services.